Today, Maxine is going to show you how to create this quick and fun make, perfect for Valentine's Day. We're going to be using an embroidery hoop to create a super-sweet decoration which will make a really thoughful gift or lovely piece of wall art for your home. Hearts are synonymous with Valentine's Day, so what better design to adorn our embroidery hoop! Using just buttons and decorative paper, this make is perfect for beginners as the design is so simple to create. We opted for the stunning First Edition Beyond the Shore papers paired with aqua blue buttons for this design, but you could tailor the colours to suit your décor. For this make, we also chose a 6" hoop but you could tailor your design to fit a smaller or larger hoop depending on your preference! 1. Draw around the embroidery hoop onto a sheet of Beyond the Shore paper. Tip: Cut the circle slightly smaller than the one you’ve drawn, just so that it looks better once adhered to the hoop in the next step. 2. Adhere the circle paper to the hoop with Dovecraft crafters glue. 3. Cut a heart out of paper and use this to draw around onto the hoop – this will be a guide for where you need to place your buttons later. Allow for a gap beneath the heart to adhere your letters. 4. Adhere buttons to the outline of the heart, starting with the lightest colour and adding darker buttons as you go to create a gradient. Fill in the heart as you go. 5. Add Simply Creative stickers at the bottom of your design of the recipient of the heart. You now have your finished design. 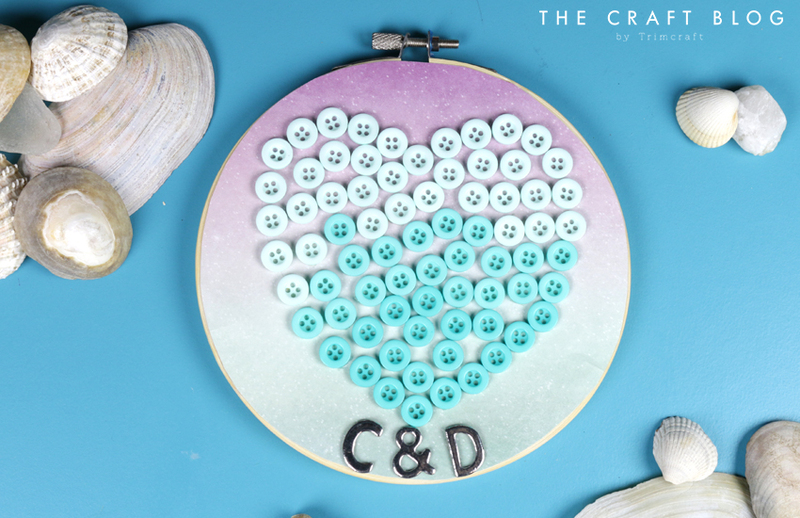 We’d LOVE to see your DIY Embroidery Hoop Hearts, so don’t forget to #Trimcraft when uploading to social media and to share your projects in the Inspiration area. It's so sweet, especially with Valentine's Day coming up!